Prominent & Leading Manufacturer from Nagpur, we offer sheathed thermocouples and non contact type roller surface thermocouples. The minimum sheathed probe diameter can reach to 0.5mm, other size will be 1mm/1.5mm/2mm/3mm/4mm/5mm/6mm/8mm probe diameter. The thermocouple insert core and the protective tube are insulated. The thermocouple inserting core conforms to DIN EN 60584 and / or DIN 43710, which can provide a double type. Test pressure: 40bar (helium) leak test – measuring end. 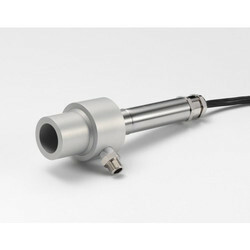 Being the most respected organization guided by experienced and knowledgeable professionals, we provide an enormous assortmentNon Contact Type Roller Surface Thermocouples.Our adroit professionals use optimum quality components and ultra-modern technology to design these surface thermocouples. Used for measurement of temperature of pipelines and cylindrical shapes, offered surface thermocouples are availed in diversified sizes and designs, to meet the needs of our clients. 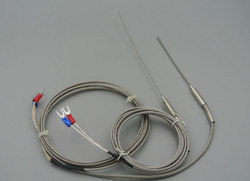 Moreover, these surface thermocouples are praised for their different qualities including high strength.